I guess that one of those entries is this pattern? Under Glaze W? Band Honey? I have a Design Line saucer. I wondered what set it came from. However I am no more enlightened! Mine is a lighter colour (I think) than yours. (the one in the gallery). 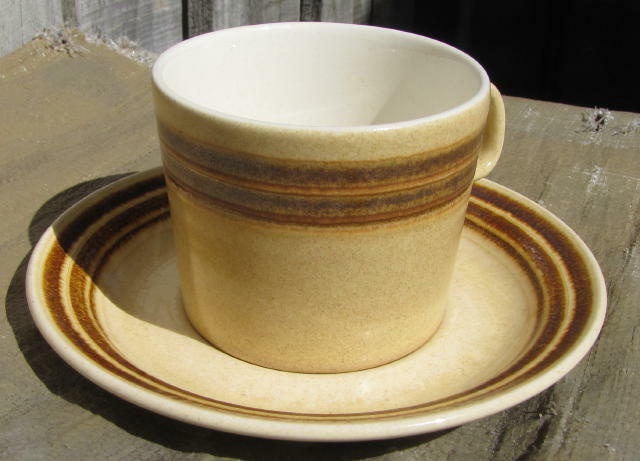 Glenys sent a photo of her Design Line saucer, which looks like it takes a coffee can shaped cup. Maybe this mug could have fitted the saucer? So now we have two colours of Design Line. Which one is honey and which is tan? My vote is that your one is Honey and narna's is Tan. I may the answer to this, I have some saucers that have Design line on them, but it has bugged me for a while that they were not only different colours but the inner banding was also different. 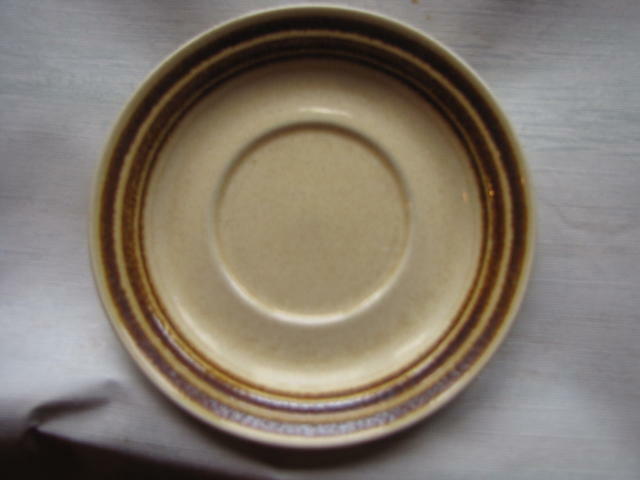 I also happen to have a cloister side plate and has just realised that the darker inner banding on the lighter coloured saucer matches the banding on the cloister plate. The inner banding on the darker more burnt looking plates is jagged where are the other is darker and sharper. Hope this all makes sense. Photos to come. Here's the cup with the saucer! I had them both all the time! And I agree that they go perfectly with cloister but that's Avondale Selection!!! This pic is a better colour representation than my one above too. Is Design Line Crown Lynn then? Hi there, yes Design Line is definitely made by Crown Lynn. 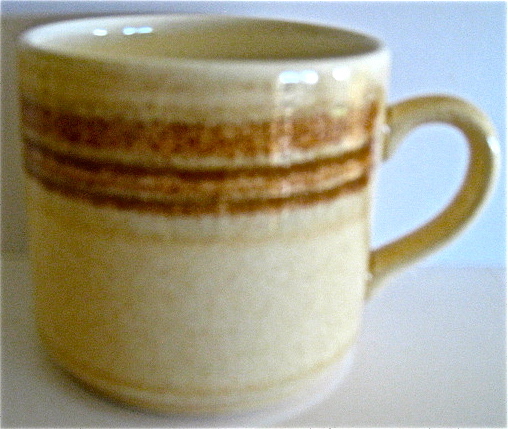 Val Monk's Collectors Handbook page 43 says that this ware was made c.1970's. Thank you so much for that Ev. You're so helpful! That solves the mystery! 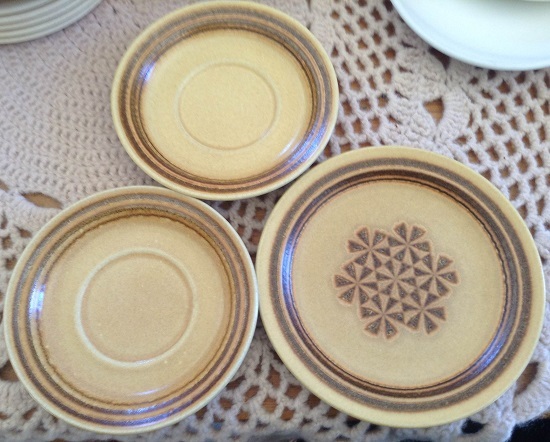 The "bread plates" are a slightly more golden colour than the honey of the cups and are backstamped "Made in New Zealand. The whole thing came together so I presume a set. Is it OK to post images on your facebook and cross refer like this as I have about a dozen Petra images to upload and would have to use the same method, is this OK? It would be better if they show right here on the page without clicking, but I cant seem to insert an image. Thanks and the links are fine.